Home / SuperEagles / Who will gate crash the Super Eagles World Cup party? Who will gate crash the Super Eagles World Cup party? 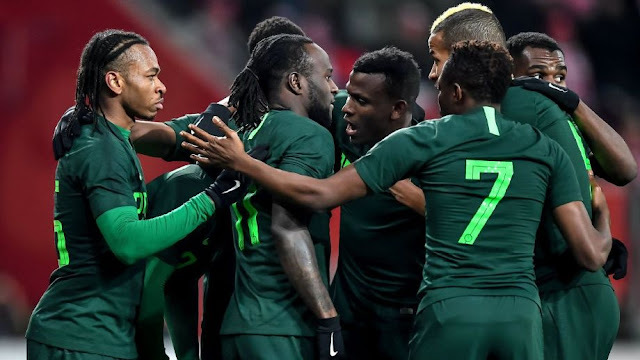 Since the release of the 30 man provisional squad to the World Cup in Russia by Super Eagles’ gaffer, Gernot Rohr, stakeholders, pundits, fans and others have been expressing divergent views about the list. Some felt that the list should have been 35 - the maximum allowed by World’s football governing, FIFA, to allow the inclusion of more players. Others argued that some notable and deserving names were omitted from the list, mentioning names like Brown Ideye, Austin Ejide, Efe Ambrose, Junior Ajayi, Henry Onyekuru, Anthony Nwaekeme, Dele Alampasu amongst others. Yet some others opined that some names do not merit a place on the list and the likes of Uche Agbo, Dele Ajiboye, Stephen Eze, Junior Lokosa and Simeon Nwankwo were mentioned. Some simply gave kudos to Rohr saying he was on the right track. Rohr had however made it clear that Nigerians should not expect too many changes to the squad as he already knows most of players he’d take to the World Cup and may only add a few exceptional players that would bring something different to the table. And giving 30 players an opportunity to fight for 23 slots is quite fair. After all countries like Iceland, Brazil, Sweden, Uruguay, France and England have already named their 23 man squad for the Mundial. So, can the new players gate crash the World Cup party? From Nigeria’s first World Cup participation in USA 94, some players have always gate crashed the World Cup party. Players that did not take part in qualification but were sought for during the World Cup preparation to strengthen the team, they’d only play a few friendly games and next they are on the plane to the World Cup. Out of Gernot Rohr’s 30 man list, only Simeon Nwankwo and Junior Lokosa are first time invitees. We can argue, though, that Lokosa is the most in form Nigerian striker with 18 goals in 22 matches for Nigerian side Kano Pillars. For a team that does not have a player with a better goal ratio, Rohr was right to give Lokosa a chance even if some argue that the level of the Nigerian Professional Football League can’t be compared La Liga and even the Egyptian Premier League. Brown Ideye plays fairly regularly for relegated Malaga in Spain while Junior Ajayi plays in Egypt for Al Ahly and both of them were omitted from the list. But if you check the stats, Ideye scored only once in 12 appearances for Malaga while Ajayi netted 9 times in 32 appearances, bagging 10 assists in the 2017/18 season. The other new boy in the team, Nwankwo is an out and out striker just like Eagles main striker, Odion Ighalo. Nwankwo stands quite tall at 6ft 6 and has scored 7 goals in 22 Serie A games for his Italian side, Crotone; obviously better stats than Ajayi and Ideye. And he sort of fits the bill of Gernot Rohr’s much sought out “battling ram” even though some can argue that Rohr already has similar and established players like Ideye and Ajayi in Alex Iwobi, Kelechi Iheanacho and maybe Ahmed Musa in the team and wants something different. Hitherto, the Eagles do not have a like for like replacement for Ighalo and that is where Nwankwo comes in. Would Gernot Rohr sacrifice a defender for an extra striker, or would a more established forward player miss the party? Stephen Eze and Uche Agbo have been invited previously to the team but are yet to feature in a grade A game. Eze is in the squad to ruffle feathers with the central defenders following his solid displays for CHAN Eagles though he is yet to play for the Super Eagles but confident performance in friendly games might earn him a place in Russia. His sojourn to Lokomotiv Plovdiv in Bulgaria has certainly improved his rating. Rohr may end up picking just 7 defenders out of the 10 listed if an additional forward is taken and the fight for defensive slot is fierce. Uche Agbo of Belgium side, Standard Liege has been a regular for his club side but has only played once for the Super Eagles, a 3-0 friendly win against Togo in 2017, although he has been in the squad 10 times. He can play as defensive midfielder and as a central defender, and to make the team he must offer something different from the numerous midfielders in the team. We wait to see if any of them can gate crash the party.